by John A. Sweeney, AFM#513. Regional differences in club racing have always fascinated me. I got my expert plates back East where many racers accepted a poorly done Krylon paint-job on their racebike, letting the results on the track speak for them, rather than the racebike's appearance. Many racers I knew where actually superstitious about a bike that looked too nice, saying that "road-rash loved a freshly painted gas tank." The West coast is different, and the racebikes here are very nice to look at. Almost makes me want to wash my bike. Even within California there are regional differences, however. 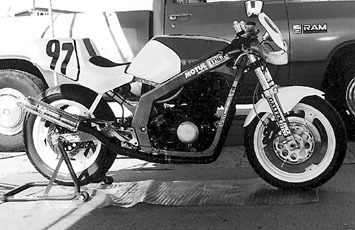 I have always been interested in the fact that at the Willow Springs Motorcycle Club [WSMC] there are many GS500s which compete in the club's 500 Twins class. In the AFM there are none. The fact that Willow Springs and Sears point are different race tracks is obvious. Willow is very fast, and a rider like Rich Munn may only use the brakes in two of the track's nine turns. On the other hand Sears Point's 11 turns are stretched out between two hard braking hairpins. A premium is placed at Sears on a bike that can accelerate quickly up through the gears. The EX500's liquid-cooled, eight valve engine dominates at Sears. At Willow the air-cooled GS500's beefy chassis makes a fine racebike for that track's wide-open sweepers. One of the finest GS500s at Willow belongs to the United States Navy's Richard Munn. Richard has been with the Navy for 15 years and is stationed in San Diego at the Fleet Anti-Submarine Warfare Training Center Pacific. The '95 season saw him stationed on the USS Elliot (DD-967). Rich's tour at sea ended in '95, however, and he now leads the points after struggling to overcome an early season points deficit when he blew an engine prior to the January event. He plans to run WSMC events, including BoTT Lightweight, Formula Three, 550, Superbike, and 500 Super Stock, as well as CCS events at Las Vegas Raceway and Firebird Raceway. Rich plans to run the CCS's Lightweight Supersport, Lightweight Superbike, Lightweight GP, and Lightweight Super Twins classes. Rich built this lap-record holding himself with some help from the folks at National City Motorcycle. The bike appears very professional and features an excellent paint job that Rich did in his driveway with a $15.00 touch-up gun and a 5 hp compressor. The money saved on the paint gun was used to buy high-quality Chroma Base paint which Rich says is responsible for the superb finish. 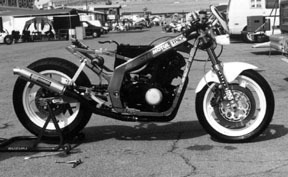 The front end was salvaged from an '89 GSX-R 1100 and was a 99% bolt on modification. 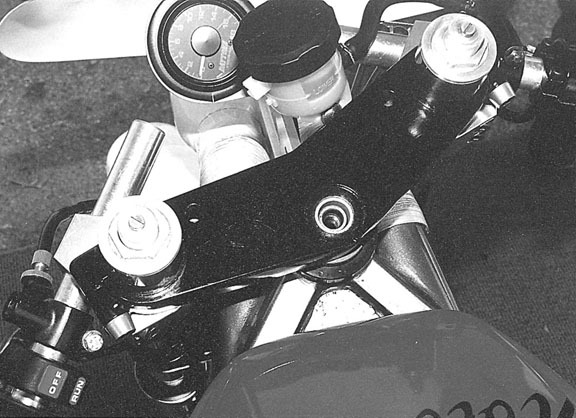 A spacer for the front-end swap was fabbed and used with the GS stem and GSX-R triple clamps. The new front end weighs only 1 lb. more than stock. The bike runs on stock GS500 rims which are lighter than GSX-R wheels. They measure 3" at the front and 3 1/2" at the rear and Rich usually runs Metzlers on which he has set several lap records at Willow Springs International Raceway [the BoTT Lightweight record is around 1:33 at Willow]. Munn laid up the fiberglass air-box himself. It features a ram-air system with a fiberglass scoop under the GSX-R numberplate. 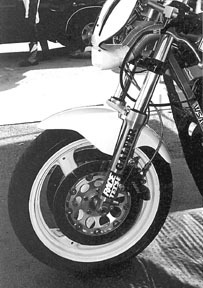 Twin heat riser tubes run from the numberplate scoop to the frame-rails into which Rich cut holes using a die-grinder. 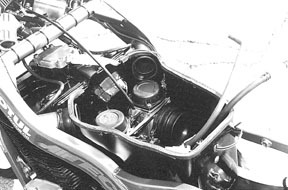 The airbox is then connected to the frame for a positive induction system. The engine features a windage tray, which keeps power-robbing oil away from the crank, and positive crankcase ventilation, which helps the rings seal better and thereby increases compression. Rich says that National City has 25 hours into porting the head, which also has 1 mm-over stainless valves. 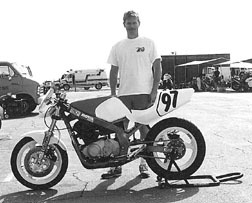 he 34 year-old's best season since he began racing in '91 with the American Road Racing Association has been the '94 season in which he was Champion in BoTT Lightweight, and runner-up in both Open Superstock and Open Modified Production on a GSX-R 1100. Rich captured the WSMC's #5 plate with that effort.